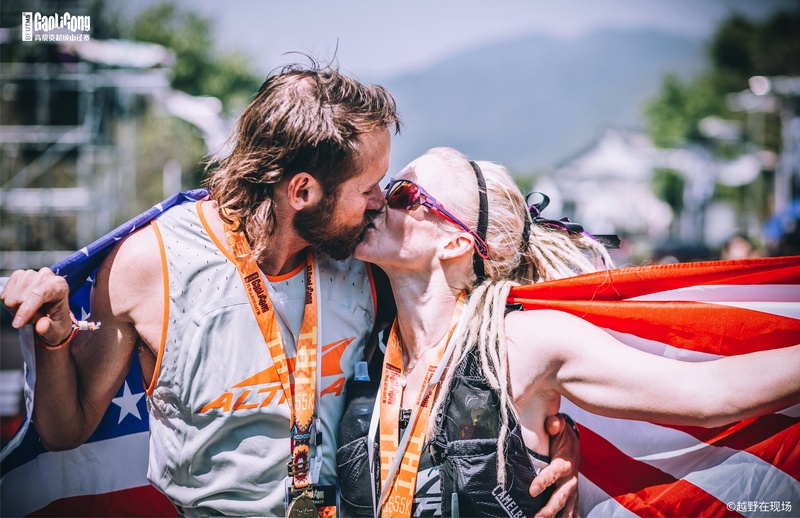 USA’s elite athletes Jason Schlarb and Meredith Edwards – both second in Gaoligong by UTMB THT (55KM), talk about how Gaoligong by UTMB® compares with UTMB, about Chinese runners, the Flying Tigers. Jason Schlarb: Hard Rock champion, Run Rabbit Run champion, Zion 100 champion, 4th at UTMB. Meredith Edwards: 10th at CCC ® in 2015 and then second at TDS® in 2016. Congratulations, you are both second, are you happy, or not? We are very happy with our results, but we are not in the best shape right now, to be honest. We live at elevation, 6,500 feet, in Durango, Colorado, but now it is all under snow, so we ski tour instead, but this means you only train going up, not going down! Did you feel UTMB connection at Gaoligong? At the end, running through in Heshun, I felt that UTMB® vibe! Plus, the steepness of trails, the huge vertical gain, this is all indicative of UTMB. Of course, it had its own elements – climate here is very different, but the people are so welcoming, so generous. The start was great, it had great energy, and the UTMB song! It was awesome, awesome, to celebrate our sport like that! In the US, our races do not have this power and energy. Chinese people are very enthusiastic, and this makes it really special. This race is above and beyond what I experienced in Chamonix! The volume of Gaoligong race was crazy, Chinese people are brand new to the sport and they are fanatical! There were so many people coming to have a look to the CPs! I think it was even bigger than UTMB, the energy was so much bigger – the music, the lights, the dancing girl. Logistics and transportation were great. Dedicated buses, easy to use, Great logistics. What do you think of Chinese runners? I was impressed by how young some were. As athletes, they are absolutely impressive! The work ethic of Chinese people is something special, and Chinese runners are the same – Chinese will get it done, or will die trying. I raced a race in China, Yuzhu Mountain, and a Chinese girl raced so hard, she collapsed at the end! Chinese runners give their all. The guy who finished third, I was behind him for a while, I saw how exhausted he was, he fell very badly, was hurt, but he truly gave his all. I really respect that, he was so committed, fully committed. Also, he insisted on running with me, I usually do not like running with others, but he was so friendly, he was feeling stronger at one stage but he did not take off, he waited for me, he walked a few uphills with me. I did not expect that, I did not want him to wait, but I was so impressed by his sportsmanship and by his camaraderie! What he did, it was really impressive and so surprising. I was an officer for 10 years in the US airforce. I felt the presence of the Flying Tigers here. I really respect and appreciate that the Flying Tigers are so honoured here in Yunnan. You know, Meredith’s uncle was a pilot during the war and he died when his B29 plane crashed in China. We think it was here in Yunnan and we want to know more. So, this race is special for us. My dad, when he found out about the race and the connection with the Flying Tigers, really wanted me to go. It felt the race is close to our family. Sunmaya Budha – just 19 years old, and what a result! She was sixth overall in THT. Any advice you have for her? Her age makes her achievement even more impressive! She is going to be somebody in the sport for sure in the future! My advice would be: not to race too much. She is young, excited about racing, but must learn how be able to say no, and not race. Most people who race ultras too much, not all, but all but many, end up burned out. The disappear as fast as they appear. Fast people, especially, they do not last. For this reason, I would recommend that Sunmaya does not go up in distances too fast, she should run short and run fast, building up a platform for when she is older and then she can go longer in races. She must be smart about her racing, and it is harder than running, perhaps the hardest thing! Do you think China has future in ultra-running? I think China will have many great trail and ultra-runners in the future – it has a huge population, and lots of fast road runners. I also think that ultras are a great fit for Chinese people and China as a country. The country has the money and also the natural resources – so many great mountains and beautiful landscapes! Chinese people love to do crazy things, they love to push themselves. Great fit – people have the toughness and the country has great places to do it! Describe Gaoligong by UTMB® in a few words! Steep, jungle, high mountain ridges, lots of culture. Fanatical energy! A celebration of a new frontier for Chinese runners. Unique!